My nephew wanted a sword cake but when I went online to get ideas there weren’t any sword cakes. So for those of you looking for ideas here’s one. I started off making a 9×13 cake and I think I made a 8 inch square just to have some extra just in case. When the cake cooled, I cut the 9×13 into 3rds the long way. I needed a long platter so I used the bottom of an apple box and covered that with a plastic table cloth. I placed 1 1/2 of the strips on the platter and I trimmed the cake so that it was angled on both edges like a double bladed sword. And then I made the tip on the end. The handle was the other half of the 2nd strip of cake. The last strip was used as the hand protector. I just placed them together so that it looked like a sword. I frosted the cake with homemade butter frosting. I made the sword gray by just mixing different colors together to get gray. And the handle was frosted yellow for gold. I also made different colored jello for the jewels on the cake. I just cut shapes and placed them on the cake. But you have to keep it cold so that the jello doesn’t melt. I used the rest of the cake to put happy birthday on. My nephew was impressed that I came out looking like a sword since he knew I had no pictures to follow. I just looked at real swords on the internet to get an idea. Perfect, just the idea I was looking for, thank you. 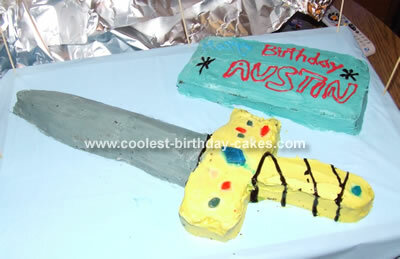 Thanks for the great idea for the sword cake. My 7-year old grandson is a sword guy lately. I know he will be so so surprised when I present this sword cake – thank you!